What are the 9 steps of Writing a Social Media Strategy for Government and Corporates? Writing a Whole-of-Organisation strategy is not simply a Facebook content calendar or a Twitter schedule (though those are important).This is for those of you that get stuck with writing a strategy for the whole organisation where most people are saying 'we've got a Facebook Page, so we've got social media!" or "I quite like Instagram, we should have an Instagram account!". Identify the pain points and the hopes/wishes briefly, the circumstances and backstory and any anecdotes you can glean (CEO wants a LinkedIn group, we had problems on Facebook, Instagram is really popular with our staff). This is probably just notes from your initial meeting/s. It’s not really the strategy bit, just getting your thoughts together. Make sure you are clear on what a strategy is: your stakeholders might not be. They think a content calendar for Facebook is a strategy. It’s a tactic or tool. Focus on the Questions in the Strategy. Who, what , why etc. How can be examples (but not the actual content calendar for example). 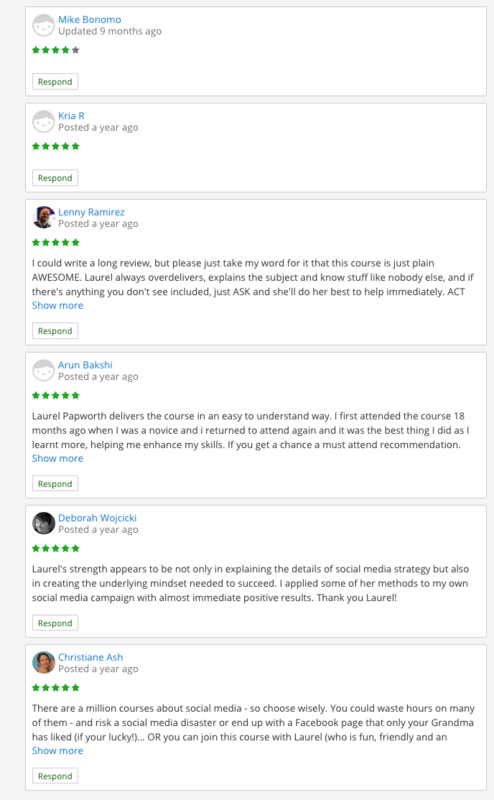 Students in 9 Step Social Media Strategy online course: Please go to the Client Brief area and choose one of four – B2B, Social Good, B2C and Gov. If you get stuck ask in Discussions for help? 1. What is the Purpose and Values to Customer and Organisation? What does the Organisation get out of a Facebook Page. Up front and privately? What does the member – stakeholder, client, customer, fundraiser etc – get out of engaging with you. Why on earth would they like your Facebook Page. Be clear. Have a list (education, entertainment, competitions, giveaways, helpful tips). Add in Values. What subjects are close the Brand’s corporate social responsibility vs which one’s to stay away from. Starbucks is strongly gay-marriage friendly. Nothing to do with coffee. 2. Who Are the Market Segment and Customer Avatars? Journalists? young female customers? retired time-rich couples? lobby groups, new in a job, re-entering workforce after time off. Investigate the whole customer avatar, not just the demographic segment. This means psychographics and behavioural. Critical for understanding how Facebook Optimization (and soon, Twitter) affects the newsfeed of those you are trying to engage with. You cannot BROADCAST on SOCIAL - the platforms penalise you. Figure out who you are targetting on each Facebook Page, LinkedIn Group and Twitter account. 3. Which Social Media Platforms? If you don’t want to end up with 50 million Facebook Pages by every department or one big Page that appeals to no-one use the Purpose/Values and the Segment/Avatars to define likely platforms. Instagram for photos, YouTube for videos, Twitter for Press, LinkedIn for Employer Branding. Whatever you have decided. Map your platforms to customer segment and use. Students: please note the social media press release lectures covers examples. Community management is moving people through from Visitor to Lead to Customer to Engaged Customer through a series of Call to Actions. Throughout the Strategy Document should be clear the call to actions and alignment with the different market segments, at different times of their lifecycle with you. Asking newcomers to introduce themselves through to Member of the week. Without this, there is no re-engagement back to the community. Look to Tourism Australia’s Fan Foto Friday and the processes there… would a newcomer post the first week? 5. How Do We Identify and Engage with Key Influencers? Stop with the PR Spam already! Find the right Key Influencers for the right customer avatars and engage with them appropriately. Ensure that the various social media “owners” internally are aware of the benefits of key influencer engagement (bigger take-up, social proof, faster velocity) and the dangers (negative reviews, annoyed and irritated Top Bloggers and Twitterati). 6. What is the Brand Voice? Staff are often scared of posting up the wrong thing and post nothing. Which is substantially better than the Facebook admin who posts up inappropriate jokes and fluffy cat videos every 2 hours. What is your Brand Voice – are you edgy like Lynx or Virgin Airways, educational like Bunnings or a bank, evocative and fear based like Amnesty International? How do staff know what to post and what is on topic. The preceding part of the strategy will help to clarify this (purpose, values, customer avatars etc) and set the tone, topic, sentiment and so on of your Voice online. 7. What Campaigns and Activities? After monitoring, creating voice and content, engaging with key influencers comes Promotion. Is a competition relevant to a health community? Would discount coupons help engagement on a Ferrari Page? Doubtful. Find the right campaigns (by listening) and create the right promotions from that interaction. Do an audit, set a baseline, create KPI’s and measure, measure, measure. Know your audience rituals. Young fit men? Don’t ignore sport updates. Women with new babies? Vaccination is a hot topic. Throw Back Thursday vs Follow Friday vs HumpDay – which one fits your customer avatar the best? Daily, weekly, monthly rituals. Not everyone is up for Talk Like A Pirate Day (Krispy Kreme did well this year!) but maybe International Women’s Day on March 8th needs more than a single update? Plan the conversation diary 1 week, 2 weeks up to 6-8 weeks out and ensure it fits in with Campaigns. The Content Calendar and Conversation Diary comes from identifying key campaigns and activities. Those activities are on target, on brand voice. Brand Voice is related to Customer Avatars/Segments and their Key Influencers and where they are in the Lifecycle, which connects back to the Purpose for connecting with you and your Values. If you are interested in a (nearly 4 hour!) 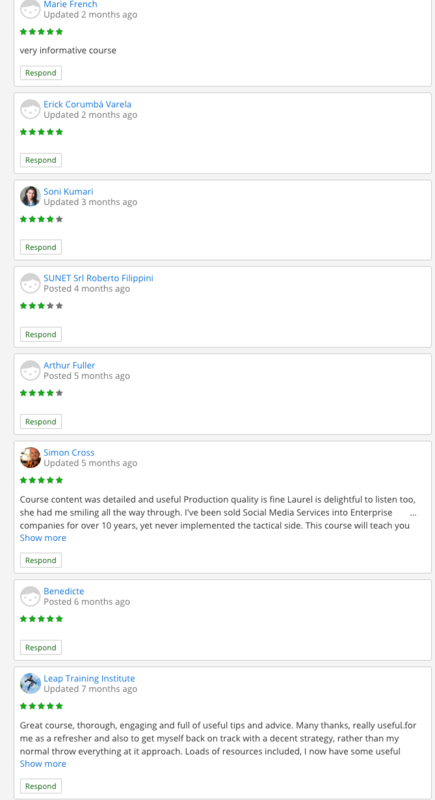 online course with a Theory section, Practical/Case Studies section and Homework (around the Client Brief) section, please click 9 Step Social Media Strategy for Marketing and Public Relations for a website discount. There is an Android and Apple app, 30 Day money back guarantee and a Discussion area for question and answers. Hope to see you there! Download the strategy guideline document and the strategy template to fill in. Please email [email protected] if you have any questions. This course is part of the 3 Day Social Media Intensive in Sydney and corporate training rooms. Social Spaces and Which Platform?